Our simple yet informative guide to the Danbury Active, Royale, Surf and Trail VW camper conversions should help when understanding the model differences. Danbury are probably best known for their Volkswagen T2 or Bay window Camper conversions. They first offered a VW camper conversion back in 1964 but then ceased trading in the late 1980s until their name was bought and reborn concentrating on converting the brand new Brazilian built T2s and building T5 camper conversions. In 2014 VW ceased production of the Brazilian T2 campers for good. We buy Danbury Active, Royale, Surf and Trail campervans, so if you have one to sell please get in touch by calling 0121 453 4577 or by using our online valuation form. 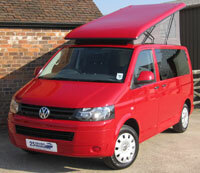 View our current stock of Danbury Campers for sale.